G’day all, hope you northern hemisphere folk are enjoying the brisker weather and warm fires etc. Those hanging in Hawaii, you know who you are, just keep hangin’. Just a short catch up on the Master Key Mastermind Alliance class progression. 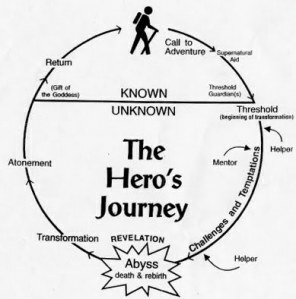 This week is a special examination of Joseph Campbell’s work, the monomyth of the Hero’s Journey. Basically he studied thousands of stories that have been popular with audiences and some passed down for thousands of years, to discover they all have a common fabric. Unlikely hero resists a call, gives in, takes the call to be a reluctant hero, faces adversity, persists and eventually wins. Saves the day or is victorious where no apparent victory existed. Sounds too simple a formula to make every story popular and movie successful that follows it, however with a short look at the most popular myth to biggest box office success, there it is. Campbell’s work apart from exposing a perfect formula for a good story is also a pathway to enlightenment on how to recognise what stage we are at personally and what we are needing to do next. We all want to be a hero in some way or another, being small doesn’t serve us and certainly doesn’t add value to the world around us. Accepting we are all here for a purpose and letting go of ‘stinking thinking’ about ourselves and those in our life, instead bathing the whole picture in love, is important to our success. Equally important is the need to move through the process of becoming our own hero. A cycle which continues through life (if we allow) and grows our confidence in our ability to go around it again. Campbell’s work gives us the heads up on what is ‘normal’ for people to experience whilst on the path to herodom and of course the best bit, what comes next. The essence of being a hero I guess is the step from the comfortable known into the unknown. Part of the ‘Law of Attraction’ that many struggle with is the letting go of knowing how, when and what will happen on the journey; allowing the law to bring into reality the people and resources required to succeed. We worry, which in turn pushes our end reward further away. On the live webcast in the MKMMA class for this week we watched a TedX Talk by Aimee Mullins, who demonstrates how to be a hero and shows how the story can just unfold and get better and better. Here it is for you. The message this edition; develop a burning desire based purpose, make it the focus of your life, leave negative thoughts behind instead choosing a positve story. Then persist and let it unfold. P.S. I also realised during the examination of this weeks material, that I am a hero and have demonstrated over and over the willingness to take the call on all but a few occasions. Right now I find myself at the edge of the next step into unknown territory, the leadership of my own Network Marketing team. Even though I know the business, the company, the products and am equipping myself with the skills required … what gives, hey. It is about letting go, not allowing myself to have an excuse to be small, to go forward and grab hold of my purpose, to become the highest mountain. To serve and help others to succeed to whatever level they are wishing to rise to. Our best progress comes when were are facing and moving through the unfamiliar.